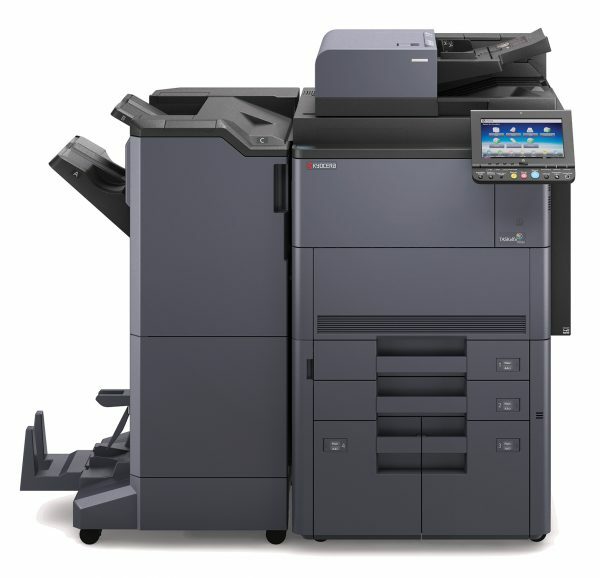 The Kyocera TASKalfa 7052ci from RYAN is a versatile color MFP that combines intuitive walk-up copy, scan and optional fax functions with flexible desktop and mobile printing tools. The high speed, single-pass scanner quickly routes documents to virtually any destination–email, network folder, USB drive, etc. Equally impressive engine speeds deliver output at up to 65 pages per minute in color and 70 pages per minute in black and white. Customize the TASKalfa 7052ci with optional paper trays, advanced finishing, the popular EFI® Fiery Controller and Kyocera’s plug-and-play Business Applications. Fully scalable and ultra-reliable, the TASKalfa 7052ci turns cumbersome processes into seamless efficiency.